Vidroha Jamie (aka Jamie St Clair) teamed up with award winning and grammy nominated producer Kit Walker, and the band Indo Reel, a collection of international world musicians for the Indian, Celtic, and jazz fusion cd Indo Reel. Released in 2004, it was picked up by several syndicated public radio programs like Echoes, a late evening syndicated broadcast, and still gets radio, internet radio, and satellite radio play. 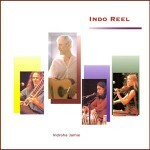 Indo Reel features Vidroha Jamie (guitars), Kit Walker (jazz piano, bass), Prem Joshua (sitar, bamboo flutes), Manish Vyas (tablas), Toni Talia Marcus and Tanmayo Boyd (violins), Chinmaya Dunster (sarod) and Naman (trumpet). New Leaf Distributing Co., 401 Thornton Rd, Lithia Springs, GA, 30122. Tilopa Publishing, Ph 303 800 5447. Tilopa Publishing online.